As millions of us try and enjoy the warmer weather this weekend, we may well find ourselves spending more time swatting as we try and eliminate a particularly irritating and uninvited guest than eating. Wasps are unfriendly guests pretty much everywhere in the world! Wasps disrupt us and occasionally occupy our outdoor rooms, like garages. Not only that, but their attacks are very unpleasant, their stings could cause allergic reactions too. Wasps become difficult to relocate once they set up home and may create a nest remarkably fast around your home. 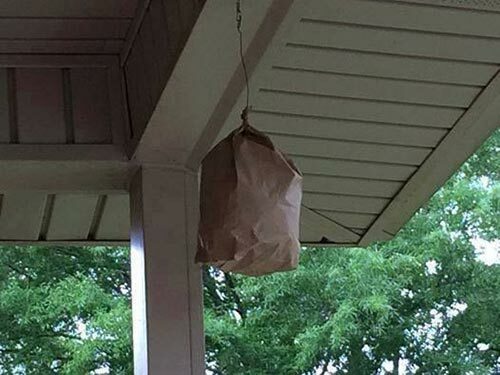 This is a guide about keeping wasps from your house using just a brown paper bag. This method works and it works well. If you enjoyed this article, would you mind taking a few seconds and sharing it on your Facebook or Twitter and if you have a Pinterest account, give it a pin, this way a lot more people get to see our posts and you can help us out tremendously.